Unique gel technology ensures the product "grabs" to your brush, meaning no drips and easy application. 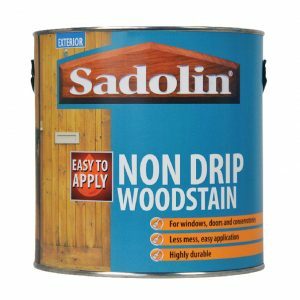 A water based stain for use on all exterior woodwork including windows and doors. Not suitable for decking. Touch Dry 1-2 hours. Recoat in 4-6 hours. Available in 750ml packs. For coverage and quantity for your job, use our calculator. A general purpose woodstain, suitable as a two coat application for planed or rough sawn timber. 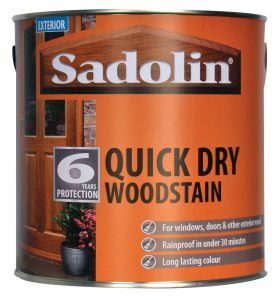 Also used as base coat for timber joinery to be finished off with Sadolin Extra Durable Woodstain. A solvent based stain for use on decking, cladding, fencing, fascias and garden furniture. Touch dry 4-6 hours. Recoat in 16-24 hours. Available in 1, 2.5 & 5 litre packs. Traditional "wood" colours are available off the shelf, while our extended colour range is available only from Colourmixing stockists. For coverage details and to work out the quantity for your job, use our calculator. A semi gloss finishing coat for windows, doors and other exterior joinery. 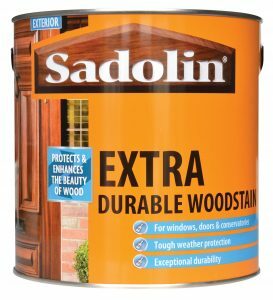 For best performance on new timber, use with a base coat of Sadolin Classic Wood Protection followed by two coats of Extra Durable Woodstain. A solvent based stain, touch dry 4-6 hours. Recoat in 16-24 hours. Available in 500ml, 1, 2.5 & 5 litre packs. Traditional "wood" colours are available off the shelf, while our extended colour range is available only from Colourmixing stockists. For coverage details and to work out the quantity for your job, use our calculator. 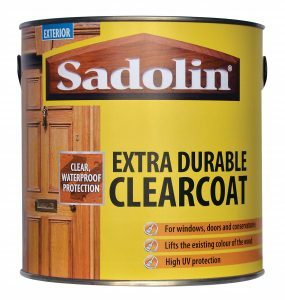 A protective coating or maintenance coat to retain the existing colour of your wood or to stop woodstain shades darkening. Resists peeling, blistering and flaking. Can be used on its own or in conjunction with Sadolin Classic. Available in satin or gloss in 1 & 2.5 litre packs. A solvent based coating for use on joinery and can be used on cladding & other boarded surfaces. Not suitable for decking. Touch dry 4-6 hours. Recoat in 16-24 hours. For coverage details and to work out the quantity for your job, use our calculator. Up to 6 years protection offers maximum durability. A water based stain, rainproof in under 30 minutes. Touch dry 2-4 hours and recoat in 4-6 hour, gets the job done in a day. Use on all exterior woodwork including windows and doors. Not suitable for decking. Available in 500ml, 1, & 2.5 litre packs. Traditional "wood" colours are available off the shelf, while our extended colour range is available only from Colourmixing stockists. For coverage details and to work out the quantity for your job, use our calculator. The impressive high gloss finish of Yacht Varnish will enhance the natural beauty and colour of your wood, while protecting against wear and tear with a durable layer of varnish. 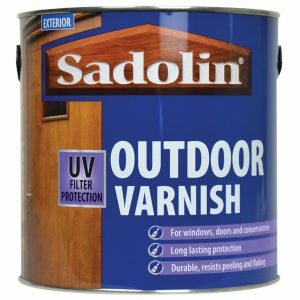 Formulated with UV additives to protect against damaging UV light, Sadolin Yacht Varnish resists peeling and flaking by forming a high-build protective barrier on top of your wood. 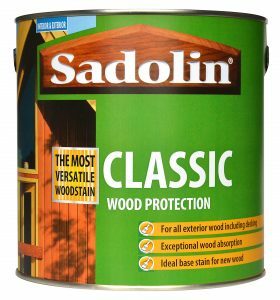 For a matt or satin alternative, see Sadolin Outdoor Varnish. This solvent based varnish builds a tough protection layer on exterior doors, windows and conservatories. Touch dry 4-6 hours. Recoat in 16-24 hours. Available in 750ml & 2.5 litre packs. Not suitable for decking. For coverage details and to work out the quantity for your job, use our calculator. A tough, clear, varnish with UV protection for doors, windows and conservatories. Available in matt and satin finishes. Solvent based, touch dry 4-6 hours. Recoat in 16-24 hours. Not suitable for decking. Available in 750ml & 2.5 litre packs. 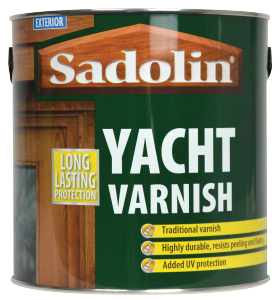 For a high gloss alternative see Sadolin Yacht Varnish. For coverage details and to work out the quantity for your job, use our calculator. 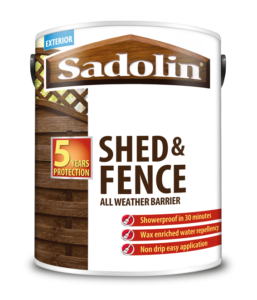 Shed & Fence paint provides 5 Years Protection for both rough sawn and smooth planed sheds and fences. Shower proof in 30 minutes. Wax enriched water repellent. Non drip easy application. UV protection for long lasting colour. Quick drying. Available in 5 and 10 litre packs.